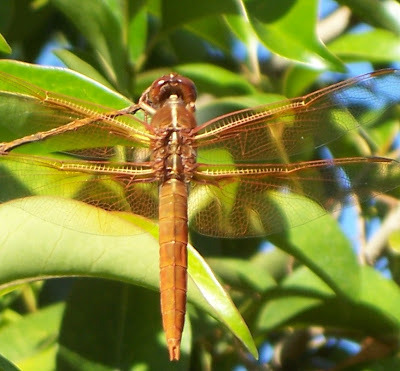 Have you ever gotten up close and personal with a dragonfly? This one came to rest on one of our bushes the other day and stayed there quietly while we managed to take a picture. Fascinating huh! Fortunately Herbie didn't see it. He would have eaten it. Yuck! That is such an awesome photo!! Look at how sheer its wings are! Cool! Almost looks like it's made of metal. Wow! Fabulous photo. Great job. Absolutely stunning photo! And you know, I know they are harmless but I'm still scared when I see one flying too closely to me lol.